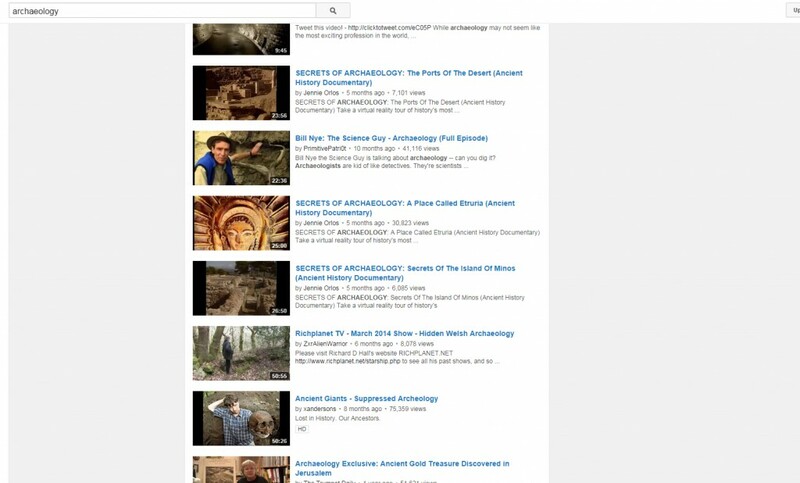 A recent chat that I had with Mr. Soup prompted me to uncover what other archaeologically minded channels there are on the Internet. A quick search of the word archaeology quickly soured the taste in the mouth; Secrets of Archaeology, Hidden Welsh Archaeology and Suppressed Archaeology were all that appeared to me. It seems that archaeologists are hiding something, and in this mystical magical world of possibility lies well formed opinions devoid of bias and unnecessary handwaving. I wish. Our first indication of something being a little off were several videos on ancient giants; it took me a while to research what people were actually talking about. Basically, parts of the Bible allude to giants (nephilim) being born of a union between fallen angels and human women. There is a very good blog article by Jason Colavito debunking the conspiracy about bones belonging to giants being in the Smithsonean. This and many other videos really get my goat in terms of representing Archaeology on Youtube, either a ludicrous cover up of ancient culture or as evidence for biblical archaeology. I am almost furious that we as a discipline have allowed our online presence to become a haven for what can only be called fringe archaeology. Most archaeologists will scoff at the mention of ancient aliens and other such fantasies but it seems for many on Youtube, these are real and believable theories. In addition, someone attempting to learn more about archaeology in general is swamped by hour long documentaries talking about Sodom & Gomorrah, Confirming the Bible through Archaeology and the Secret History of Archaeology. I want to be clear that I don’t want these types of programs removed, nor do I want to silence people’s opinions; I just wish that the online landscape of archaeology better reflected the real world of archaeology. That being said, delving deeper into the Youtube search reveals slightly better results from the 3rd page onwards; however we must ask ourselves how far will people go to find information? Will it be the first video they see? The best thumbnail? In that case we are failing on many parts. This is why we need more channels like Archaeosoup if we want to better represent archaeology online, which is, for many, a first point of reference. The podcast scene is a little better than Youtube, owing to the format mostly. Topics can be talked about at length, with a lot of podcasts clocking in at around 1 hour long. The flexibility of podcasting also lends it to being used as a resource, no flashy image editing needed and many people are happy to listen for a long time. 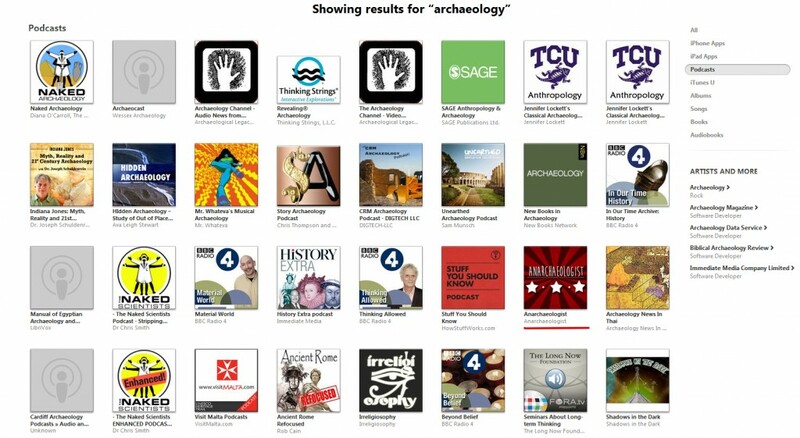 The Naked Archaeologists, Archaeocast and the Archaeology Channel make up some of the first results for a search of “archaeology” in the iTunes Podcast directory; something far more promising than a Youtube search. However where does this leave us as archaeologists and consumers of media? Should we rail against these types of shows which misrepresent what we work on and love? I was lucky to have the skills to add to the podcast world and decided that since what i was looking for was missing that I would fill in the gap, instead of just complaining. However I understand that this isn’t viable for every archaeologist, especially considering time but that doesn’t mean that archaeology is forever doomed to fall by the wayside. It’s time for us “media archaeologists” to band together, to create links and to cross promote. One just has to look at the online gaming community on Youtube to see the interconnecting patchwork of channels and shows that span let’s plays, reviews and first impressions. Why can’t we have that? Where is our online community? Our let’s digs, review of current literature and our own ideas about sites? Maybe it is time for us to come out of the woodwork and work together; if you had a chance to listen to the recent podcast episode, archaeologists’ apprehension and fear of misrepresentation in media is fairly common but maybe this ‘holding back’ and neat presentation of archaeology has in fact allowed certain voices to drown out others. It is possibly time to come out, all guns blazing and make archaeology “angry”. The same passion that drives people to dig for weeks and months, to collect tiny fragments of the past and carefully piece them together and attempt to build a picture of the past; shouldn’t the same passion be found when conveying that information in a meaningful way? There are many ways of discovering new material, if you know where to find it; my journey began only recently and I regret slightly that I didn’t try harder before but armed with this podcast idea, I was able to engage with people. I learned so much so quickly, especially from discovering my first guest’s blog Archeogaming, which combines two different subjects commonly considered differently. Andrew Reinhard’s latest piece on Numismatics is a fascinating idea and I will be watching that space carefully. Other great examples are blogs like Savage Minds, the guest article on what do archaeologists do? was of particular interest to me. The site Past thinking contains a page dedicated to online archaeology blogs, which lists some of the many blogs out there. It is obvious that content that is created with care and a lot of passion is out there in the mists of the internet, waiting to be uncovered; unfortunately much of it is obfuscated by made-for-market media that dominates search engines and has money assigned for promotion. It is sometimes easy to believe the illusion of the internet in being democratic (although this seems to be slipping away every day) but ultimately in archaeology there seems to be a bridge to cross to find good material. Possibly it is time not only to create great media, but also great ways of finding that media.